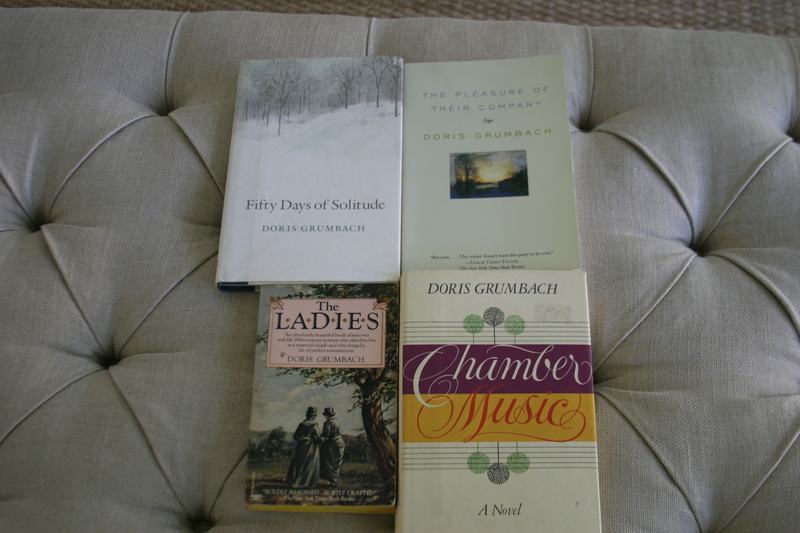 I had never even heard of Doris Grumbach until I stumbled across her on my recent 3-hour book binge at Powell’s in Portland. With so many authors and titles I knew about making their way into my basket, it is hard to explain why and how a total unknown would make the cut. If I remember correctly, it was her book Fifty Days of Solitude that caught my eye. The solitude part made me think of the wonderful journals of May Sarton and the 50 days part made me think of how I love a challenge. Apparently it is a journal/memoir of the author spending 50 days completely on her own. I assume it is a journal but since I found it in fiction, maybe it is made up. Nonetheless, it seemed like something I would enjoy so I put in on my pile. Then I noticed several other title by Grumbach. What if I ended up loving her and had only purchased the one title? Then again, what if I bought more than one title and discovered that I didn’t like her at all? As is apparent from the photo above, I took a chance on Doris. What will soon be apparent is that I am so glad I took the gamble. I’m not sure why Grumbach’s novel Chamber Music was the first book I chose to read from the pile of 56 books I bought that day. I think my intention was to read the first few paragraphs of a bunch of them and see which one appealed to me most at the time But Chamber Music was the first one I picked up and I was so immediately taken by it that I never moved on to sample any other book. The book is easy to summarize. Ninety-year old Caroline Maclaren (née Newby), the widow of esteemed, early 20th-century, American composer Robert Maclaren, has been asked by the other trustees of Maclaren Foundation to write a history of her life with the famous composer. What follows is the lovely, sad, beautiful story of Caroline’s rather complicated, unfulfilling life with Robert and the details of how her life unfolds after his death. In short, Chamber Music was a joy to read. Superficially I loved the turn-of-century milieu, the bits in Germany and even more so the bits–most of the book actually–living just outside of Saratoga Springs in upstate New York. I was also greatly pleased that Grumbach joins the very small number of authors I have read who can write about classical music in a believable way that doesn’t feel forced or pedantic. On a deeper level I found Caroline’s story tragic, sad, frustrating, at times hopeful, but above all beautiful. Grumbach manages to describe moments of deep pathos without ever making the reader feel manipulated. It seems odd to say a novel like this was a joy to read. Can something so sad be a joy to read? I think yes, but the word perhaps doesn’t really convey what I felt. More of a deep connection with the human frailty Grumbach is so good at portraying. I can’t wait to see what the other Grumbach’s are like. Someone I’ve never heard of – bet you’re glad you picked up several of hers now! I just blogged about Chamber Music on Tuesday and am anxious to try this one. Glad to read your favorable thoughts. Thomas, thank you for your post!! I had already read and enjoyed some of Doris Grumbach’s journals, but somehow the novels did not appeal to me at first glance and I never gave them a try. After reading your post, I ordered Chamber Music and I love it. Thank you for sharing your thoughts and for helping us to discover new books. Oo, I do like a new-to-me author with such a rave recommendation. I was surprised to find that there are eight of Grumbach’s books available through our library. Already requested “Chamber Music.” Thanks for another great book recommendation. I love Doris Grumbach. I think you will like her Fifty Days of Solitude. She’s written several memoirs and I love her style. Not so fond of the fiction, but perhaps I haven’t read the “right” ones. Check out her bio. She’s led an interesting life.